The Smoky Mountains attract visitors from all around the world every year. Millions of people, to be exact. Now, we understand why you want to come visit the area during fall. I mean, who wouldn't? It’s one of the most beautiful places to be from September to November! If you are looking for the absolute BEST things to do in the Smokies during fall, keep reading! We have you covered from Gatlinburg cabins to places to view the best fall foliage! Let’s start with where you should stay when you visit us. Sometimes, the best thing to do is stay home and relax! Watch the leaves turn colors, make some muffins and wear your pajamas all day. If you like the fall views but don’t like the cool fall temps, put on your sweatpants and admire the scenery from the living room of your Gatlinburg cabin. Curl up on the couch with a good book and enjoy the Smoky Mountains from the comfort of your living room. 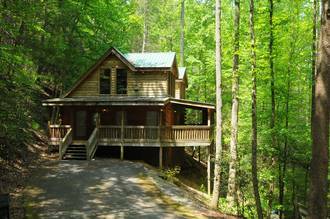 Our Gatlinburg cabins are a secluded paradise in the heart of the action! With the Smokies at every turn and Gatlinburg less than 5 minutes away, this is by far one of the best things to do this fall. It may sound cliche, but hiking is a MUST anytime you are visiting the Smoky Mountains! However, if you want an experience unlike any other, take a nice, long hike and explore during the fall months. You will find colors and views you thought you could only see in postcards. With the summer temps coming to an end, fall is the perfect time to take that hike that is longer than normal. Spend the day exploring the mountains and foliage that surround you! If you’re looking for a group led hike, check out the 100 year anniversary of the National Park service this month for hiking 100 miles of the Smokies! Hike as many miles as you want, at your own pace and learn about the rich history of these beautiful mountains. It’s Saturday morning, and that short stack and cup of coffee is calling your name! Spend your chilly fall morning in a cozy, warm restaurant with some caffeine and comfort food. If you’re staying at one of our Gatlinburg cabins, you are a 5 minute drive from the world famous Pancake Pantry. With over 100 different flavors of pancakes to choose from, there’s no better place to grab a cup of coffee and a stack of pancakes from! You’ll need some fuel for the big day ahead of you in the Smoky Mountains! Book your stay and enjoy some of the best things to do in the Smoky Mountains this season! Find your perfect cabin and start planning the vacation of a lifetime!